Blurb: Bellamy Lyston was only 12 years old when her older sister Susan was killed in a stormy Memorial Day. Bellamy’s fear of storms is a legacy of the tornado that destroyed the crime scene along with her memory of what really happened during the day’s most devastating moments. Now, 18 years later, Bellamy has written a sensational, bestselling novel based on Susan’s murder. Because the book was inspired by the tragic event that still pains her family, she published it under a pseudonym to protect them from unwanted publicity. But when an opportunistic reporter for a tabloid newspaper discovers the book is based on fact, Bellamy’s identity is exposed along with the family scandal. Moreover, Bellamy becomes the target of an unnamed assailant who either wants the truth about Susan’s murder to remain unknown or, even more threatening, is determined to get vengeance for a man wrongfully accused and punished. In order to identify her stalker, Bellamy must confront the ghosts of her past, including Dent Carter, Susan’s wayward and reckless boyfriend – and an original suspect in the murder case. Dent, with this and other stains on his past, is intent on clearing his name, and he needs Bellamy’s sealed memory to do it. But her safeguarded recollections – once unlocked – pose dangers that neither could foresee and puts both their lives in peril. As Bellamy delves deeper into the mystery surrounding Susan’s slaying, she discovers disturbing elements of the crime which call into question the people she holds most dear. Haunted by partial memories, conflicted over her feelings for Dent, but determined to learn the truth, she won’t stop until she reveals Susan’s killer. Review: I loaded this book onto my Nook and started it on my airplane ride to Hawaii. I was immediately sucked in and I have to say that it was the perfect vacation book. I found it to be very fast paced and exciting. I could hardly stand to put it down because I kept wanting more and more of it! I especially enjoyed how a tornado really played into the storyline. On Feb. 29, 2012, my hometown of Harrisburg, IL, was hit by an EF-4 tornado. Both of my grandparents and my parents were all in the path of this storm. And it was a killer storm too – I believe 7 people lost their lives. My family was lucky to walk away with their lives, but their homes and emotions were not as intact as their physical beings. Knowing what a storm like that can do to a person, I found it very intriguing how Bellamy’s fear of storms and her memory loss was tied to the tornado in the book. Little by little, Bellamy’s memory came back to her. I quite enjoyed seeing how she pieced everything together – what was revealed to her by something very minute would bring back quite a chunk of her memory. The who-dun-it part of the story, while intriguing, was not exactly surprising. About halfway through the book I began to suspect the person who did end up being the killer. Like I said, it wasn’t really all that big of a shocking twist, but it still came together quite well at the end. This book would not be for the under 18 crowd. There was quite a bit of steamy encounters between Bellamy and Dent. Personally, it didn’t bother me, but it might not be for everyone. Overall, I thoroughly enjoyed this book. 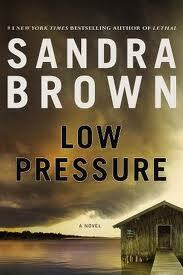 I feel as if it’s another great book by Sandra Brown and one not to be missed! Highly recommended. One of my longtime favorite authors, thanks for reminding of this one and glad it turned out to be a good time filler for your trip Tara. It has been way too long since I read a book by this author. I really, really need to get back to her as I used to read and enjoy her books all of the time. I’m adding this one to my TBR list so thanks for the great review!